Teslanomics took a crack at the question based on data pulled together from Tesla owners around the world. Before entering their data, drivers had to follow a very specific process for draining the battery and then charging it to ensure consistent results. Ben took the crowdsourced data and stubbed it into an excel sheet that he beautified with Tableau. The resulting chart maps out battery capacity over time based on the mass of crowdsourced data and shows a clear trend. Battery capacities drop off a few percent within the first year and then stabilize at around 91% capacity in what looks to be a very stable curve across all samples. There are clear deviants above and below but no drastic outliers. 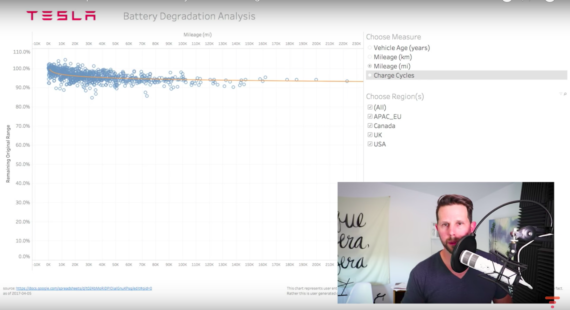 The analysis breaks out the data by most of the relevant factors one could wish for, including vehicle age, number of charges of the battery, vehicle mileage, and region. These tests all make use of the commodity 18650 battery that has been the foundation for Tesla’s products since its inception. Moving forward, Tesla is migrating to the new 2170 cell that is believed to hit the sweet spot between cost, ease of manufacturing, energy density, weight, and performance. The 2170 will become the new foundational cell for all future Tesla products for the foreseeable future. The cherry on top is that these trends will also drive the cost of Tesla products down. Whether that means we should expect a Tesla vehicle at half the price of the Model 3 or not in a few years is anyone’s guess … but I wouldn’t put it past them. Check out the video below and let us know in the comments what you think the future holds for batteries.